From the information age to the innovation economy, the rapid improvements of technology have influenced and changed every day living for the better. From hailing taxis, to grabbing an Uber, collaboration and sharing have proven to upset old business models. The growing number of millennials in the workforce have a global mindset, are highly educated and technologically sophisticated. 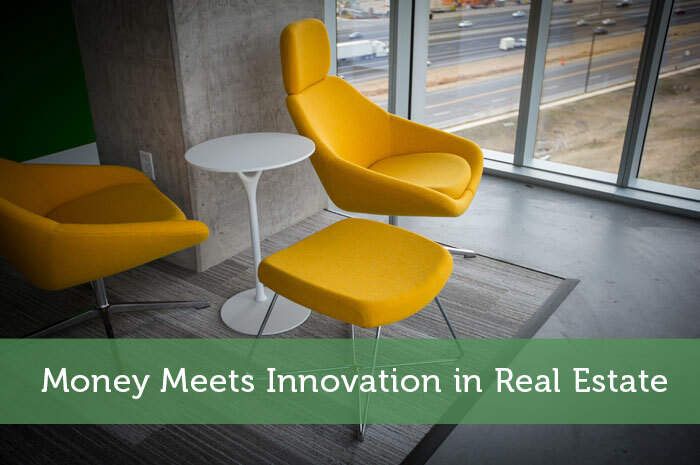 As creators and designers of the workplace, the real estate industry is on the cusp of change. Tech-driven entrepreneurs want nimble, more collaborative, and creative solutions from those who design, build, and operate their workplaces, according to Technology, Real Estate, and the Innovation Economy. Innovation and improved technology is on the rise across many established industries. Commercial real estate, for example, has seen an increase in startups within the space. These new businesses focus on a variety of aspects in real estate including new listing and search services, leasing management software, investment/crowdfunding and data, valuation and analytics, among others. Using CB Insights and analytics, we see that venture capital funding has grown significantly to $582.8M in 33 deals last year alone from practically $0 in 2011. Tech in real estate was not as robust in the past as it is today. Naturally investment follows innovation. Over the last five years the top two venture capital firms in the commercial real estate technology space were Thrive Capital in New York and 500 Startups in California. The two have invested in a combined total of 17 companies. New York and California represent the top locations for commercial real estate technology companies. It’s not just about how much you raise but the value provided in the market place. Redfin – total funding $166.95M – is a customer-first real estate brokerage that represents people buying and selling homes. Founded and run by technologists, Redfin has a team of experienced, full-service real estate agents who are advocates, not sales-people. The staff earns customer-satisfaction bonuses instead of commissions. Redfin.com features all the broker-listed (MLS) homes for sale, as well as for-sale-by-owner properties that don’t pay brokers a commission. The company serves major markets across the U.S. and has closed nearly $20 billion in home sales. DocuSign – total funding $513.43M – is an online document signing platform that allows professionals to create legally compliant electronic documents using digital signatures. Numerous enterprises, business departments, individual professionals, and consumers have incorporated this resource into their business processes. Companies and individuals use DocuSign to accelerate transaction times to increase business efficiency and reduce costs. John Delia is a young developer and landlord from East Hills, NY now residing in Columbus, OH. He studied City and Regional Planning at The Ohio State University. Having started his own investment firm at age 21, he now writes and talks about building wealth with passive income through real estate and living life on purpose.